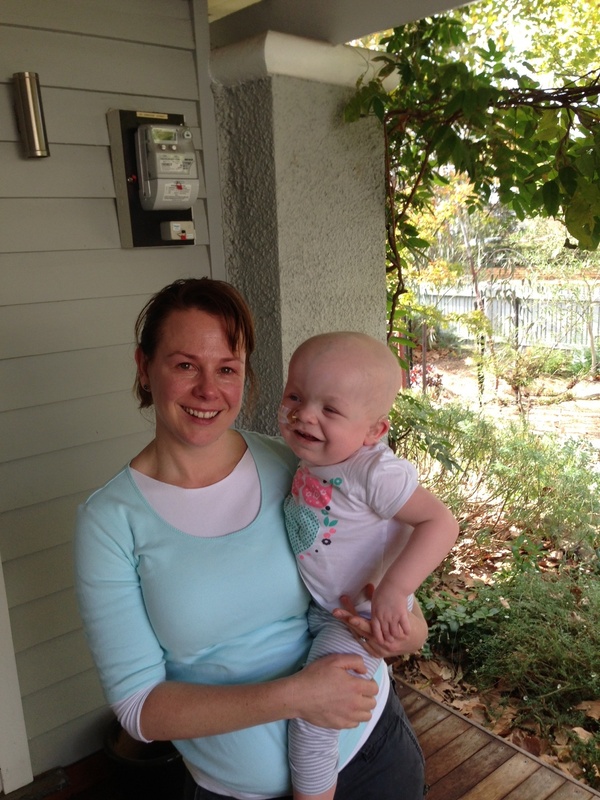 Orla attended Australian Hearing today for her first hearing test following her transplant. We had some hope that her hearing may have improved as she has seemed more responsive and receptive to sound of late. She has been startling to some louder noises with only one aid in hence we have left one aid off until we knew for sure. Orla’s hearing has definitely improved in the sense that she no longer has fluid in her ears referred to as a conductive loss in addition to her nerve or sensoneural loss. However, unfortunately the test today found Orla’s sensoneural hearing loss to be much the same as prior to her transplant. Performing a hearing test in a child of Orla’s age is difficult, and can be affected by many things. The child has a probe put into the ear and a sound is projected through it at the same time a puppet appears which an audiologist holds behind a curtain. If the child hears the sound, it is hoped that they will turn their head to the puppet to confirm it. A second audiologist sits in front of the child to watch the child’s more subtle signs of hearing the sound like raising eyebrows or stilling. There is hence a fine line between the second audiologist maintaining the child’s interest so they are not constantly looking for the puppets but without engaging the child so much that they lose interest in the puppets! 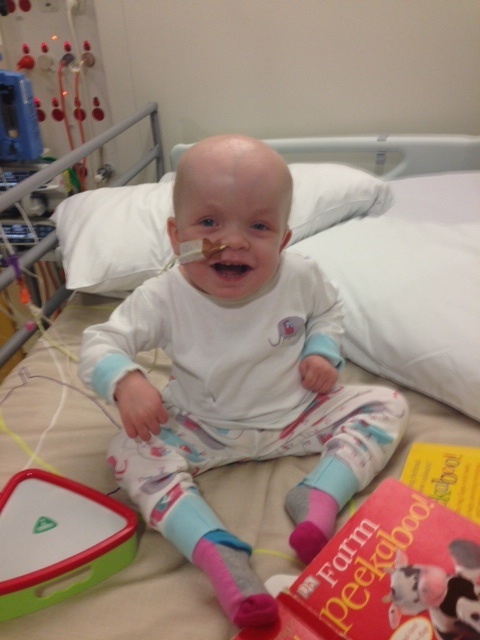 Whilst we were hopeful Orla’s hearing had improved, it is positive that it hasn’t declined. Her threshold to high frequency, commonly referred to as high pitched, sounds may have worsened slightly. Orla’s hearing impairment is classified as moderate. She is able to hear some speech sounds in human conversation but possibly not all as some are presented at different levels as well as frequency. The audiologist agreed today that Orla’s reactions to sounds are quite sensitive as well as her being quite visually alert. This can often result in one sensing, especially a hopeful parent, that a child is hearing more than they are actually are. Orla was also somewhat nervous for the test today so her physio Belinda will be pleased to hear she is not the only one that she screams at! It is however pretty understandable given everything she has been through over the past while and the room where the tests are held are sound proofed and almost like a bunker. The audiologists said that many children who have been hospitalised for long periods respond like Orla did today. In addition to the hearing test, a test called a tympanogram is also performed whenever Orla attends her Aus hearing appointments. The tympongram uses a machine to check the air pressure in the ear and can thus tell if there is a presence of fluid, wax or in Orla’s case as it appeared today, a blocked grommet in her right ear! We will now need to contact her ENT doctor….! To finish this post; below are a few stories of interest to us which may be to you too. Day + 96 Cool catch ups with Orla! My gosh, there are a few more things that require me “doing” at home (predominantly washing – I REALLY miss the linen skip) rather than in a hospital room. However the quietness of isolation at home is a welcome relief from the stressors of the past few months but also lonely at times. We have been fortunate enough to have a few special visitors including Orla’s cousins, Oscar and Leo. This was a visit with a difference as we had to sit outside and it happened to be pretty chilly on this particular day. Orla found this to be quite a shock after 3 months in a temperature controlled environment, making her reluctant to smile nicely for her Aunt Lucy! The reason for sitting outside was so Orla could see her cousins as she isn’t able to have contact with children and their germs at the moment and only well adults are allowed into our house. Pa also came for a visit and Nan is staying this week. Grandpa George has also booked flights for a visit in July. Orla remains well and happy. We have been home 3 weeks today, although it does feel like longer . It also feels like we have been in a time warp for the last few months, the only telling reason that so much time has passed being the change in season from the midst of summer when Orla was admitted and we are now lighting the fire every night! 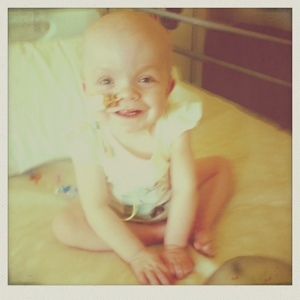 Orla attends the hospital just once a week currently and to date she is progressing well. 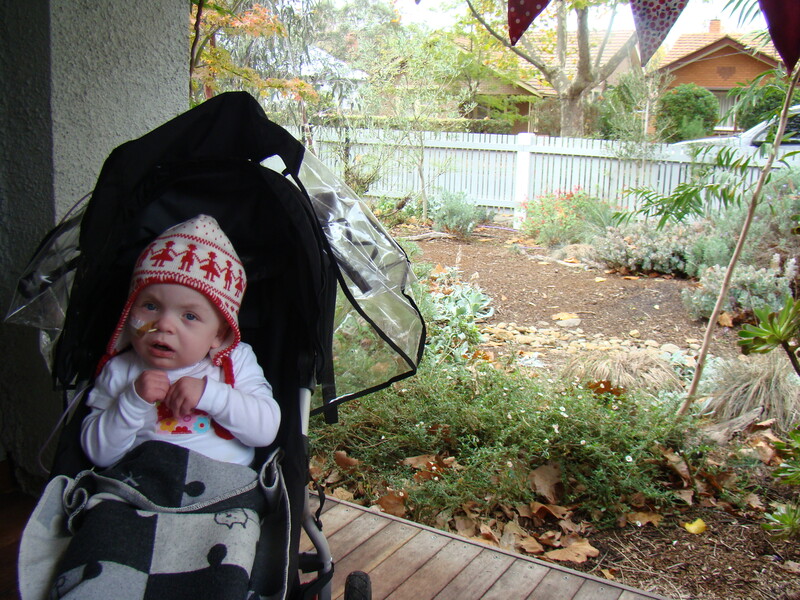 She still enjoys her visits to RCH especially the social aspect as she is quite familiar with the environment there. On one occasion, she was shouting so loudly that the consultant and I couldn’t hear each other talk!! As Orla draws closer to 100 days post transplant, the acute stress of whether or not she will survive is dissipating and hence it is only now that Ed and I are starting to really come to terms with her diagnosis. The bone marrow transplant will no doubt help Orla but there is currently still so much uncertainty in our lives. At 22 months this week, Orla isn’t eating (most likely due to the effects of the BMT), talking, walking or even crawling and whilst we have much hope she will achieve these milestones the unknown is hard to deal with. And yes, we do need to and try our best to take every day at a time and be patient however it is challenging. We were saddened to hear yesterday that the child across the corridor from Orla in the BMT unit passed away on the Friday following Orla’s discharge. He unfortunately was just short of reaching his first birthday. Life is so cruel at times. His parents returned to the unit on Mothers day, his mother’s first, to collect their belongings where they had been living since their gorgeous son was 4 months old. He had a an immunological condition but he lost the battle due to infection despite his father donating his bone marrow twice. Finally, I applied for a Musical Moments scholarship for Orla offered by the charity Challenge and we were informed on Monday that Orla was successful. The scholarship consists of $500 to spend on musical experiences and we plan to use it for musical therapy at home over the next while which I know she will thoroughly enjoy. We discussed the option today of combining music therapy with her physio as Orla has now clued onto who Belinda is and what it means when she arrives..!! There was some serious coaxing required here today and reluctantly we had to resort to Justine Clark on DVD to get Orla to cooperate or rather stop screaming at poor Belinda, a great sign that her memory is functioning!! Day + 83 Going well….. The past week since we arrived home has been pretty hectic. Ed had last Thursday and Friday off work plus the weekend which was lovely. 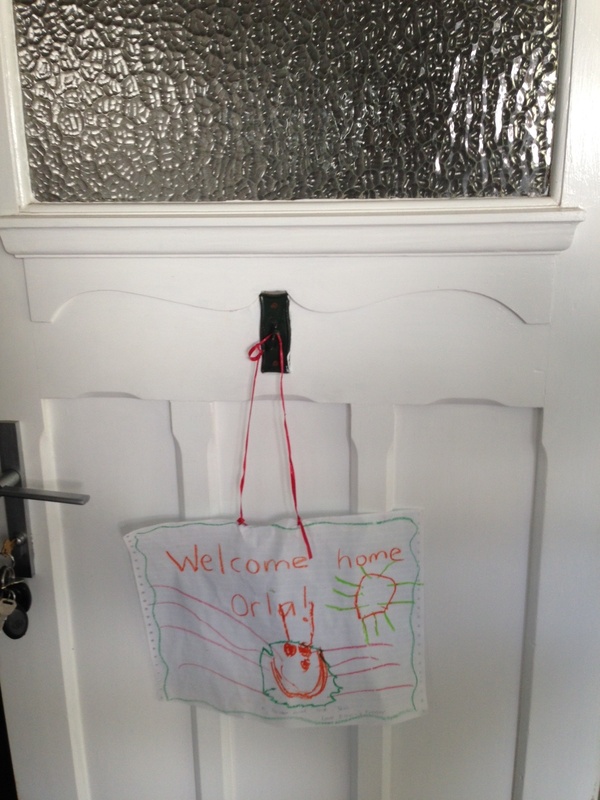 He returned to work on Monday and Orla and I have been readjusting to life outside the 4 walls of her room at RCH. Funnily enough, Orla seems to be in some ways more at home on the occasions we have been to RCH since her discharge than she is here! Although she was in a room only, she had a constant flurry of visitors, in the staff, which she obviously enjoyed! She enjoys going out in the car and has developed a liking for speed humps which has found Mum driving routes where they exist rather than avoiding them! 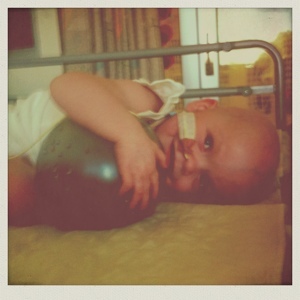 We have been back to RCH twice since Orla’s discharge and have another appointment tomorrow. Orla has blood taken at these appointments, dressings to her nasogastric tube and Hickman line changed, weight and blood pressure check and a review by one of the BMT consultants and so far all remains good. The children who have had a BMT wait in their own room when they attend the outpatients area and are first to be seen for the day to avoid any exposure to bugs. As the consultant told us last week, an upper respiratory infection in anyone could potentially see Orla end up in intensive care. Her immune system is still developing and not yet complete with all the necessary components to fight and withstand regular viruses and infections. Orla’s physio, Belinda came to see her yesterday and was impressed with her strength especially given what she has been through over the past few months. Her muscles in all her body seem to be stronger including her voice and thus her ability to scream at Belinda when she has her in a position which she would prefer not to be in! The plan is for Orla to continue her physio sessions every week from now on if she remains well enough. 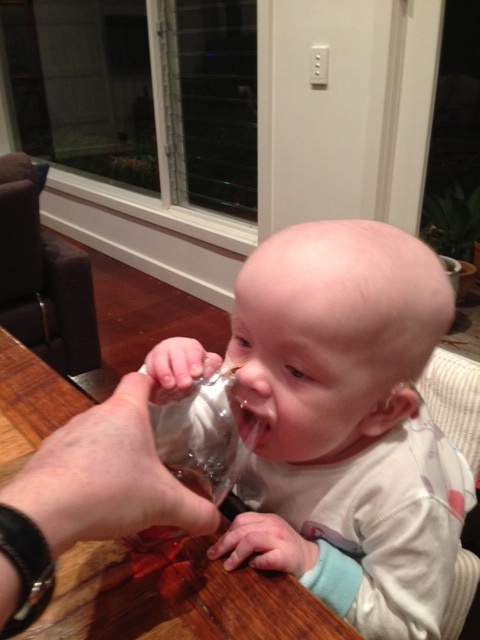 Below is a photo of Orla enjoying a few at home delights…..
Day + 75 We made it!!! Since 31st January, Orla has spent 3 nights at home..So after 12 and half and almost 7 weeks after our initial attempt at discharge, an episode of viral meningitis and a bacterial sepsis but most importantly a successful BMT , thus far, we are together at home tonight and enjoying a glass of bubbles!! We are very pleased and extremely relieved to be here although it was an emotional departure from the BMT unit. Orla, I think, will take a few days to readjust and we to unpack. It is amazing how much stuff you can accumulate in one room! The haematologist who organised Orla’s pre BMT workup returned to work just yesterday from long service leave and came to visit us this morning. (She did come in yesterday but Orla and I were her asleep!!) Her last day at work was the day after Orla was admitted…She was very impressed at how well Orla looked. Day + 73 All smiles! Day + 72 Ticking on…. Yes time is ticking on, Orla will have been an inpatient of the BMT unit for 12 weeks tomorrow… There isn’t really much to report but we are grateful for that! Orla continues to be receiving intravenous antibiotics and antiviral medication twice a day and I’m another year older since I last posted. Orla appears to be happier and stronger each day. Fortunately the antibiotics haven’ t messed with her gut and bowels too much although she has been suffering from some nasty thrush. The antiviral medication will finish tomorrow and the antibiotic course should be complete on Wednesday. We expect to be able to come home pretty soon after this but the doctors haven’t mentioned the H word…for fear of jinxing us I’m sure. We are hoping for third time lucky and expect the team will review Orla one morning soon and announce we can leave that day!